Centered on a post-apocalyptic society where food is scrarce and used as currency. In an apartment building with a delicatessen on the ground floor. The owner of the eatery also owns the apartment building and is in need of a new maintenance man since the prior one "mysteriously" disappeared. A former clown applies for the job and the butcher's intent is to have him work for as little as possible, and then serve him to odd tenants who pay the butcher in grain. The clown and butcher's daughter fall in love and she tries to foil her father's plans by contacting the "troglodytes", a grain eating sub-group of society who live entirely underground. `The French,' said James Russell Lowell, `are the most wonderful creatures for talking wisely and acting foolishly that I ever saw.' And good old Henry Adams once said that what he disliked most about the French was their mind, their way of thinking. Why? Because, he said, the French were not serious. 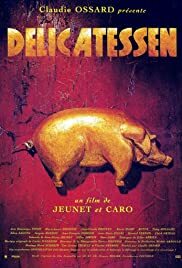 I say this by way of introduction to the French movie Delicatessen because, frankly, most French movies really bite. They have that bottom of the birdcage quality, which comes from trying too hard to be deep and philosophical, coming off as ineffably silly instead. Delicatessen avoids all of that because it doesn't try to be serious. There's nothing pretentious about it. But it could be. It's an outrageously funny black comedy. Only the French, with the penchant for speaking wisely, and acting foolishly, could have pulled this off. It's almost a satirical caricature of French society as a whole. Set in an apartment complex with a ground floor delicatessen, drifters check in, but don't check out  that is, until a former circus clown shows up. The owner's daughter and the erstwhile circus performer fall in love, throwing her father's brutally perfected supply `system' (fresh meat) all out of whack. The `process,' it seems, cannot tolerate exceptions to the rule, especially not such impractical sentiments as love. 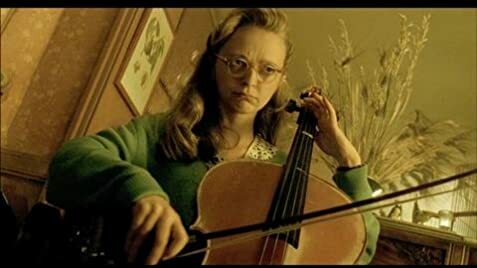 Delicatessen has some outrageously comical setups. And best of all, the inhabitants are all laughable, each in their own way, from the murderous landlord, to his delicate little daughter named Julie. I won't spoil the fun for you by telling you any more. I urge you to find out for yourself.